During our 10 days on Hawai’i, the Big Island, my family had many adventures but of course we also spent many days at the beach. The beach – any beach – is my absolutely favorite place to be so I was happy to find that the Big Island has many different kinds of beaches. 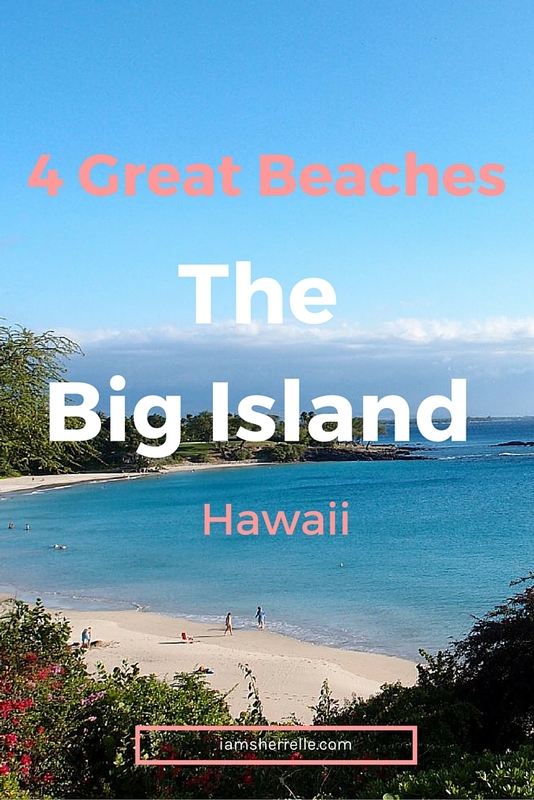 These 4 great beaches on the Big Island, Hawaii were our favorite. But first a public service announcement about safety. The beaches on the Big Island are beautiful and glorious and perfect – but while you enjoy, be cautious as well. The ocean surrounding Hawai’i is wild and unpredictable. The locals have a saying “never turn your back on the ocean.” During our vacation we were soberly reminded of the ocean’s potential danger when a boy – standing on the shore – was swept out to sea by a rouge wave, never to be found. Never swim alone and don’t leave children unattended near the shore, even for a second. Enjoy the ocean, but respect it’s power. Regularly voted among the best beaches in the world, Hapuna is probably what you picture when you think of Hawaiian beaches. One of largest beaches on the Big Island, Hapuna has lifeguards, showers, bathrooms, food vendors and a picnic pavilion. There are not enough rocks and coral to attract fish for snorkeling but because the water is not protected in a bay, the surf is strong enough for boogie boarding. Tip: Bring an umbrella because shade is scarce. Off Highway 19 in Kohala, north of Mauna Lani, Beach 69 is not easy to find but believe me, the effort is worth it; Beach 69 is an absolutely lovely with golden sand and plenty of trees for shade. 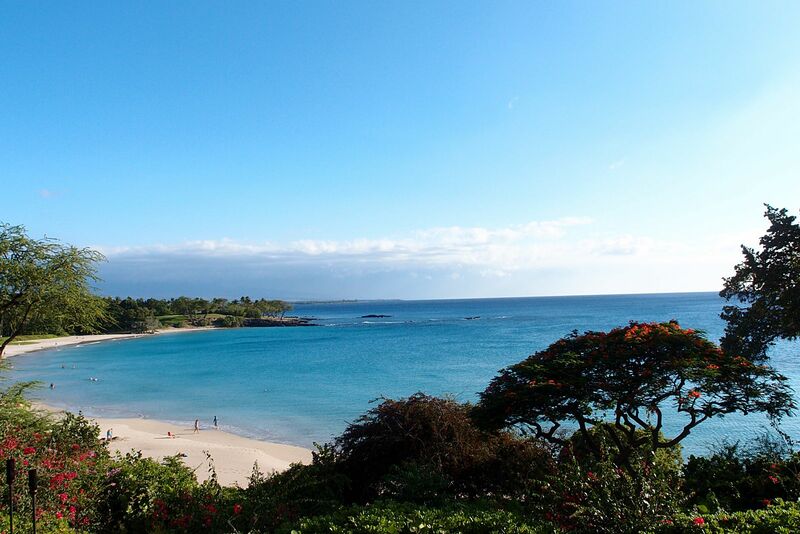 Calmer and more protected than Hapuna, it’s a great beach for first-time snorkelers because you can start snorkeling right from the shore. There are bathrooms, but there is no lifeguard on duty. This is a secret beach. Not many people know about it because it’s not easy to find. Inside the Mauna Lani Resort in Kohala, we drove up and down the street until we finally saw a tiny sign. The entrance has a gate guard to private residences but here’s the beauty – you don’t have to be a resort guest or resident; the beach is public (all beaches in Hawaii are public)! The guard will take your name and license plate and then he’ll tell you where to go. There are a limited amount of parking passes, but we only saw 10 people come and go over the course of 3 hours. Before you get to the gate guard, stop at the resort grocery store for snacks because there is no food for purchase on the beach. There is also no lifeguard, but there are nice bathrooms. The snorkeling is fantastic; we saw all kinds of fish and lovely coral too. A local told us to stay in the rocky area because it’s more protected and she would know so we listened. Tip: There is only one tree, so bring an umbrella and don’t forget shoes – the black sand is very hot. Locals call it A-Bay. Access A-Bay through the Waikola Resorts and then look for the signs that say “Lava Lava Beach Club”. The beach has ample parking, bathrooms and surprisingly good (if expensive) food at Lava Lava. There is also a grocery store on the way in the resort so you can also buy lunch and snacks there. A full service beach, you can rent kayaks, boogie boards and snorkel gear. This is a well known beach in a resort area so there were plenty of people around, but it didn’t feel crowded. On the beach there is plenty of shade and some beach loungers too. People swam in the sandy middle, but we snorkeled to the left, near the rocks. The water was not clear as the other snorkel spots we had been to and there were not as many fish, but we swam with SEA TURTLES!!!! That was so awesome!! 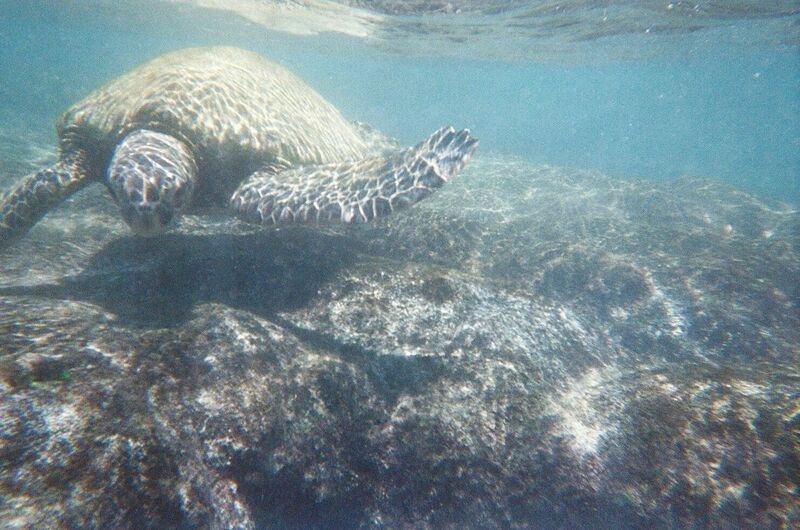 The turtles swam right up to us and posed for our underwater camera, but we were careful not to touch them. Swimming with sea turtles was definitely a highlight of our trip. Do you want to book a vacation to the Big Island now? Hold off planning for just a minute until my next post (subscribe so you don’t miss it) when I tell you about the best place to stay on the Big Island. You won’t believe it. P.S. You may also like to read about our other adventures on the Big Island in the post 7 Things You Must Do On The Big Island, Hawaii.